“Based on the volume of violent incidents and, more importantly, the identity of the people behind them, it’s easy to say: this isn’t an intifada. It’s something far worse,” wrote Asher Schechter at Haaretz on October 15. He called the current round of violence, in which dozens of stabbing attacks by Palestinians against Israelis have occurred, “a terrifying preview to a binational one-state Israel. The main narrative of some on the center and center left in Israel, has become a notion that the existence of too many Arabs in the state of Israel is a threat because of the nature of Palestinian Arabs. They are often portrayed as representing the chaos and extremism of the Middle East. The reason to support a Palestinian state, is not because of the natural rights of the Palestinians, but because administering them is bad for Israel. These views, were they generated in a European setting, would mark the center-left as part of the radical anti-immigration right. But in Israel, politics as it is, this is considered a “left” wing perspective. When Isaac Herzog debated Gideon Levy in Haaretz, the main issue was whether Israel should have more Jewish demographics and less Palestinians or should be more binational. “Levy suggests that we turn out the lights on the Zionist project,” wrote Herzog. “One man, one vote — one for Hamas’ Ismail Haniyeh and one for Gideon Levy, and may the best man win, or the majority…. [to prevent this] end we must draw on all our people’s inner strength and reach a painful decision that will preserve our future as the nation-state of the Jewish people.” Herzog and others portray the right wing in Israel of betraying Zionism and the project of the Jewish nation state. Some on the right don’t object to this characterization. Zvulon Kalfa of Habayit HaYehudi noted “We should grant Palestinians full citizenship, equality, invest in their local infrastructure and [give them] voting rights in the Knesset.” Caroline Glick’s 2014 book The Israel Solution: A One-State Plan for Middle East Peace also examines this concept. It is important to challenge this “recent violence = one state solution” narrative and show how misguided it is and how it rests on numerous false premises. In his recent article, Shavit claims: “And now, look and see. You wanted one state? You’ve got it. You wanted a Jerusalem of all its citizens? You’ve got it. You didn’t want Islamic State across the border, but rather within the border? You’ve got that, too.” The concept is that the mere fact of having Palestinians and Jews living together will produce the kind of violence Jerusalem has seen in the last weeks. This has consisted of daily stabbing attacks since October 3. Al-Jazeera even made a handy map of it. Five Jews have been murdered in Jerusalem, and more than a dozen Arabs killed. Throughout Israel and the Palestinian West Bank, the figures are more lopsided, a dozen Palestinians have been killed in attempted stabbing attacks, and no Israelis have died. When Shavit writes a “Jerusalem of all its citizens” he is intentionally referencing the “Israel of all its citizens” concept that Balad and other Arab activists have put forward. However, Jerusalem is not a city of all its citizens. As I showed in a 2013 article on voting patterns among Palestinians in Jerusalem, only around 1.5% vote in municipal elections. When Israel expanded the municipal boundaries of Jerusalem after 1967 and then annexed East Jerusalem in 1980, it didn’t create a city of “all its citizens.” It didn’t build new Arab neighborhoods, like it built numerous Jewish neighborhoods in the East. Palestinians got permanent residence status and could apply for Israeli citizenship, which around 3,000 a year do and which about 1,500 a year receive. Israel has walled off areas of East Jerusalem, such as Shuafat camp and Al-Ram, and effectively placed them on the Palestinian side of the fence, while they technically are supposed to receive services from Jerusalem. Building walls around neighborhoods, rarely if ever investing in infrastructure in a third if the city, not having any representatives from one third of the city on the council, and treating a third of the city like a violent fifth column, is not part of a state of “all its citizens.” This isn’t because a “one state solution doesn’t work” or because “Arabs are naturally violent” or because of “ISIS and the Islamic movement” or because “this is what binationalism is”; rather this has nothing to do with bi-nationalism. This isn’t Antwerp or some city in another country that once practiced bi-nationalism. This isn’t Beirut. This is Jerusalem, and it is not “one state”, it is one state on top of another state-in-the-making. The political and power imbalance is clear. For years I’ve written on East Jerusalem politics. It is entirely reactive to Israel’s actions, or perceived actions, whether it is the Mughrabi bridge affair, or the Jerusalem light rail. In the last year and a half, Jerusalem has been simmering with low level violence. 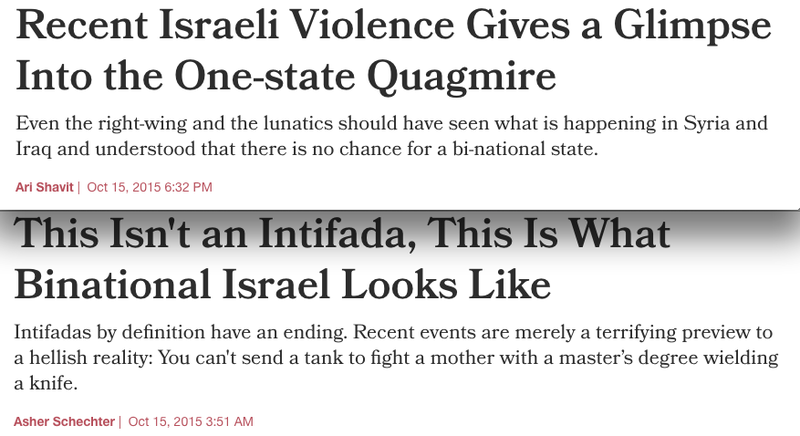 The violence of the last weeks is not the “one state solution” or a “bi-national state”. Perhaps the limited rioting and clashes in Nazareth, Jaffa and some other localities inside the Green Line are representative of the kind of tensions that would occur under a “bi-national” state, but the overwhelming violence comes from Palestinian residents of East Jerusalem and the West Bank. This isn’t “one state”, it is one and a half states. It is the Israeli state controlling Palestinians, and Palestinians living under a rump quasi-state with forms of autonomy. For those who support the one state solution they argue for a democratic state that is secular and includes Palestinians and Jews. In general they support changing Israel’s flag and national anthem and re-writing the right of return, so that Israel is not the national state of the Jewish people, but rather a “state”, similar to the US, without any national or ethnic over-riding values. Whether that idea may be naive or unworkable, is not the question. Those who claim this current violence is a “one state solution” providing a misleading analysis of the position of the one-state proponents, while at the same time distorting the nature of the rights provided to Palestinians in Jerusalem and the West Bank. In short, those who claim “this is one state” are either oblivious to the lack of rights of Palestinians or intentionally lying about those rights. Palestinians in the West Bank do not have freedom of movement. They are, for all intents, a stateless people. They can be detained for weeks on end, months on end, without trial and subject to military rule. They have no rights to free speech, or a right to vote. They are denied all the rights that Israeli citizens enjoy. A Palestinian who was born in Abu Dis in 1955, which overlooks Jerusalem, has seen highways built to neighboring Jewish communities, massive walls erected to keep him out of Jerusalem, and while he used to be able to go shop at Damascus Gate, he no longer can without asking for a permit, which he won’t receive. He can’t drive the same way to Bethlehem or Ramallah as he might have in the period of Jordanian rule or before the 1990s, instead his Palestinian green plates make him drive a long route to either place. When new roads and roundabouts and stop lights are constructed, they are to the benefit of the Jewish communities, not his. Palestinians in East Jerusalem also live in a state of semi-citizenship. Annexed by Israel without their consent, they received permanent residence status in a place they might have been living for hundreds or a thousand years, before Zionism was a twinkle in Herzl’s eye. But they can’t vote in the Knesset elections, despite the fact that a Jewish person from France or the US can come on Aliyah and buy a house next door to them and receive all the rights they don’t have. They are the local residents, but viewed as “foreigners” and a “demographic threat” in a city they are from. None of that is the hallmark of one state or bi-nationalism. That is the hallmark of an Israeli state controlling Palestinians who have no say in the matter, and who often have most or all of their rights curtailed. That isn’t “one state”, it’s an Israeli state. Insofar as the Palestinian Authority exists, it is a kind of half a state or less. It may be true that a binational or one-state would have endemic violence between the communities. But in fact if you want to ask about that model, in which Palestinians at least have citizenship, one can go look at relations between Arabs and Jews in Nazareth or the Negev. There they enjoy more rights than in Jerusalem or the West Bank, but still suffer discrimination. But there are not daily or weekly stabbings of Jews in the Galilee, in Jaffa or the Negev. So why mislead about this being “one state”? Why is that the main talking point among some on the left in Israel? Is it truly because they don’t know that Arabs in East Jerusalem lack rights? Is it because they don’t know that this “one state” is just an Israeli state controlling the West Bank? Or is it because they want to spread fear about “the Arabs” and create fear among Israelis of the “demographic threat” and thus encourage support for a disentangling from the settlements over the Green Line? What is the agenda of the “this is the one state” narrative? Do they truly propose removing 350,000 Jews who have moved into communities over the Green Line in Jerusalem? Do they propose removing 300,000 Jews from the West Bank? Do they propose keeping Jerusalem but providing real citizenship, as was done in the Golan? The fact is that the national and religious rights of the groups overlap and are not only contradictory but irreconcilable. That may mean that some level of conflict will continue no matter what. But those voices who pretend like Israel has attempted a one-state concept (like Yugoslavia) and it failed, are misguided. Israel never tried a “bi-national” concept. The little group of Ihud and Brit Shalom supports during the Palestine Mandate wanted one state. Some Communist party members also wanted one. 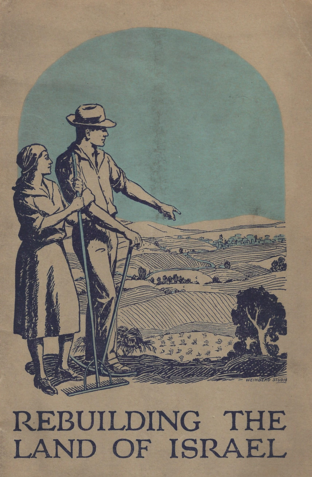 They were castigated and rejected by the Labor Zionists, like the ancestors of today’s Shavit, who wanted a small rump-state that was as Jewish as possible, and included the least number of Palestinian Arabs. In many ways the descendants of that vision are still fighting for that dream. The Jerusalem of 2015 is not the Jerusalem of ‘One Palestine complete‘ memory of the Mandate. It isn’t the Jerusalem of the 1929 riots, as some have argued. It is a muscular Jerusalem with a Jewish mayor who carries a gun and thousands of riot police from all over the country. 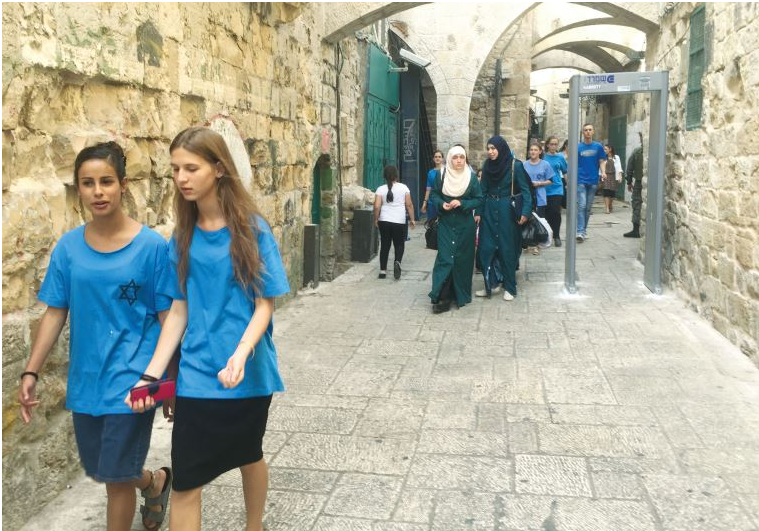 It is a Jerusalem that “seals off” Arab neighborhoods when there are stabbing attacks. It is a Jerusalem with a mostly Jewish, and entirely Israeli, constabulary who shoot Palestinians wielding knives. This isn’t a “one state” style concept based on Northern Ireland with joint-policing, or Bosnia and Herzegovina with two regions under one border or South Africa, where everyone got the vote after 1994. To pretend that Israel is any of those things, and then claim, therefore, Israel must not continue down that path, paints a totally false picture of what is actually happening. Israel may be expanding in the West Bank, it may not be reaching out towards peace, but that is not part of some sort of “one state solution” or “binational” concept, it is part of an entirely Israeli project. And the stabbing attacks, whatever they stem from, is not because living on equal terms with Palestinians creates stabbing. 99.99 percent of Palestinians are not involved in stabbing anyone. To pretend that living with Palestinians in a state, involves living with everyday violence, paints a racist and stereotypical picture. Reject the “one state” story, and investigate the real story behind the recent upsurge in violence. That means giving Palestinians a voice and looking for other reasons. Don’t trust the talking points.